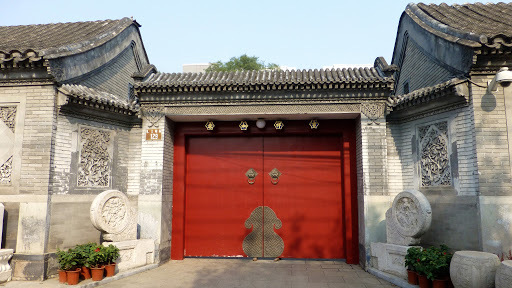 Jing, our very beautiful and smart Intrepid leader told us that the Chinese word “jing” means capital, or important – as in Beijing being the modern day southern capital, and Shangjing being the ancient northern capital. 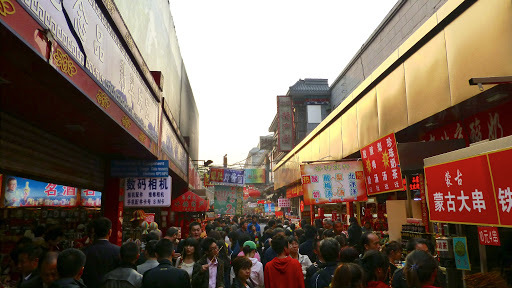 Other ancient capitals were the western capital Xijing and Dongjing, the eastern capital. So I asked Jing if that means her name also means capital and special. “Well actually (she said actually a lot), the “jing” in Beijing has an upward sound” and her name Jing has a downward inflection. Big difference if you understand Mandarin. 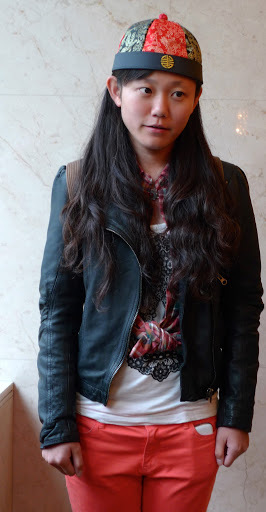 Jing told us that her parents named her Jingran for a “beautiful flower”. She certainly lives up to her name. 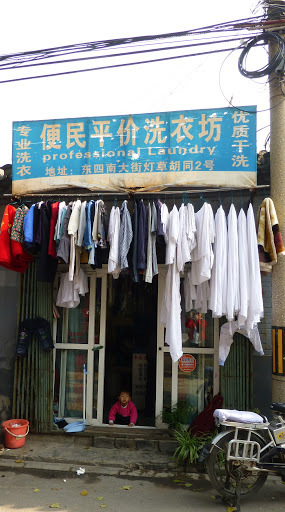 One of the great difficulties in learning Mandarin is that the spelling of a word can have five completely different meanings depending on how you say it. This variance of tone is one of the reasons we hear Chinese people speaking “at” each other and imagine that they’re arguing, or being really grumpy. 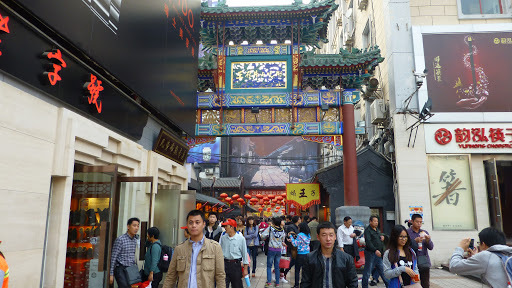 Throughout the trip, Jing did her best to teach us Chinese language, and most of us bumbled our way through basic words. But honestly, the best that most of us could manage was ni hau (hello), xie xie (thank you), zai jian (goodbye) and of course the favourite – pijiu (beer), although they do understand you if you just ask for beer. 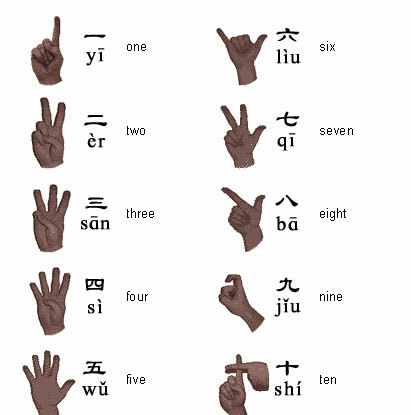 The Chinese also have this lovely way of using hand language for their numbers. 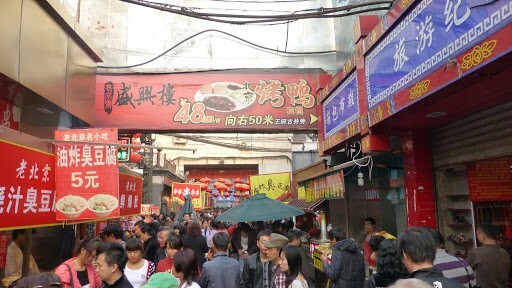 We found this particularly helpful when we were haggling at markets and couldn’t remember what the Chinese numbers were. Obviously 1 to 5 is pretty straight forward, but those tricky 6 to 10’s took a bit to remember. After once again surviving an overnight train journey, we were relieved to arrive at the Sunworld Hotel in Beijing. 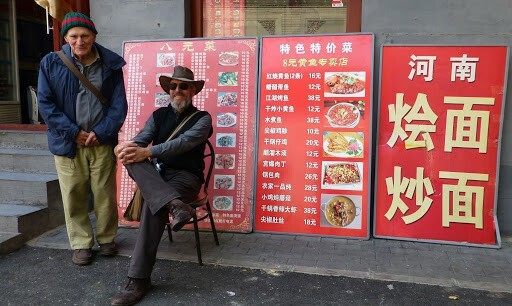 The Intrepid trip will sadly end in 2 days when we’ll say goodbye to good friends, however Dave, Sam and I will spend 5 days here in Beijing before heading home. What we found interesting about this hotel was the service felt slightly removed from that which we’d become accustomed to in the regional areas. Big city attitudes. The air conditioning wasn’t working in any of the rooms, and their response was that they turn the aircon off at the change of the season as it’s not required – just open the window. Well it was hot and stuffy in the rooms and the aircon was most certainly required (blah blah blah soft Westerners us!). Minor moans emanated from various quarters of our group, but we all took a reality check and soldiered on in good spirits. We were, after all, in Beijing! Marvelous, and how lucky we were! And in fact the weather was warm for only 1 day when the chilly Autumn air made sleeping very comfortable. So, I guess they know what they’re talking about. 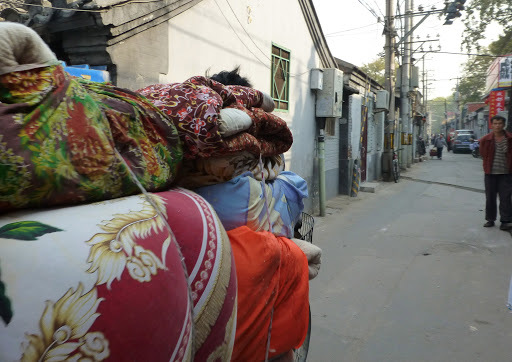 This is is a woman on a bicycle, carting what appears to be bedding. 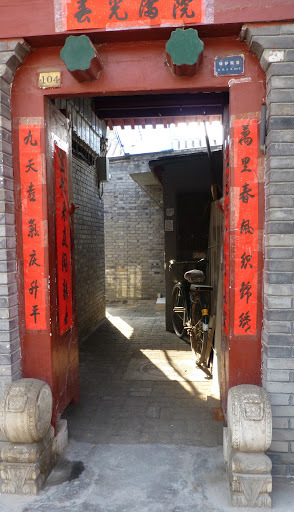 Our first foray into the wilds of this incredible city was a walking tour through Beijing Hutongs. 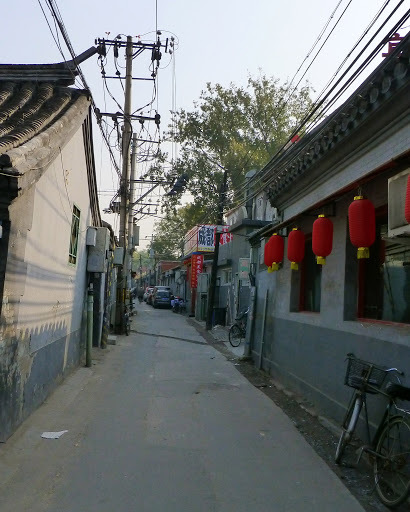 You can seriously get lost in these countless narrow lanes and alleys, and dip into the peaceful communal life of every day Beijingers. 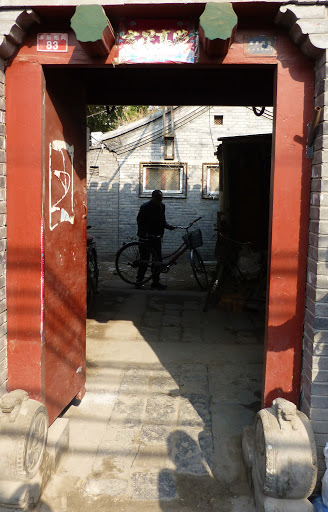 These narrow alleyways give great insights into people’s’ day to day life, which is something I’ve loved doing since I was a child, looking in to people’s’ private worlds. 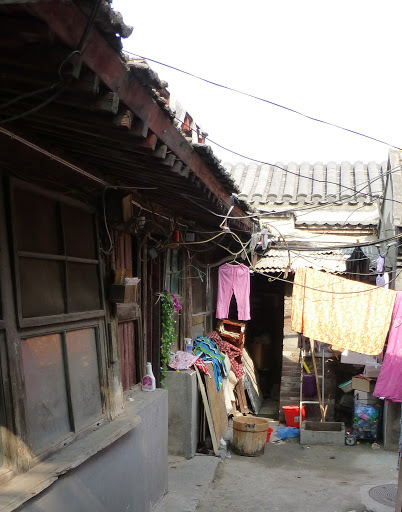 Exploring these Hutongs by foot gave us the opportunity to stop and absorb this fascinating environment. This symbol means that a wedding is pending. 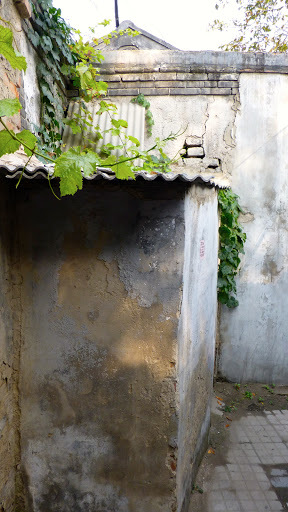 The stone sculptures at the doorways denote social status. Size does count! Innocent bystanders found themselves outside a traditional eatery. 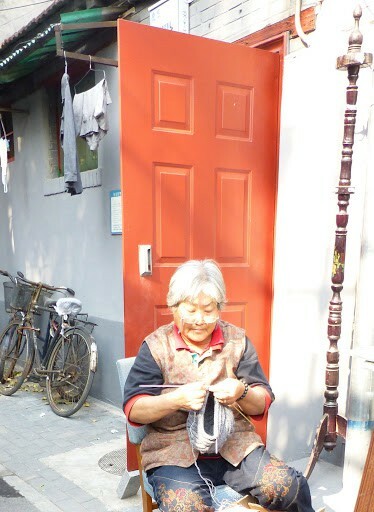 Looks like she’s knitting with hand-spun wool. 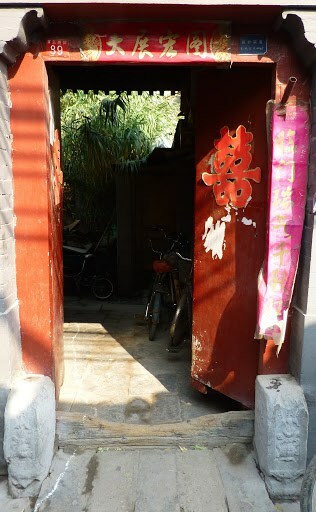 Most likely a very important person lives here, maybe a “Government Man”, judging by those doorway statues. 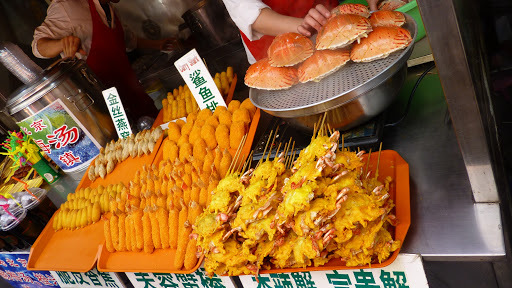 No trip to the Orient would be complete without visiting traditional street markets. In any country this is what gives us a sense of the people living in the area and their traditions. 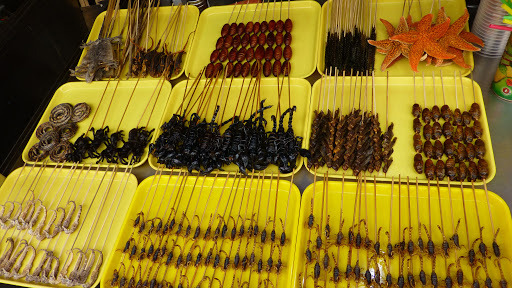 We were lucky that our hotel was very well located, pretty much in the center of anything we wanted to see and do, and we stumbled across this amazing street market which sold everything from tacky souvenirs to delicacies like snake, scorpions and starfish. 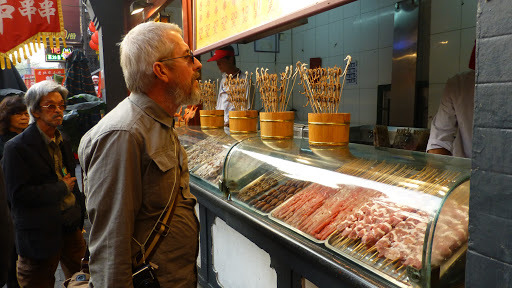 We loved it here at these markets and came back several times. I have to say though, that we didn’t try any of the food on offer. Maybe we’re not as adventurous as we like to think we are. But chomping through barbecued crunchy things is not really my idea of a good time. 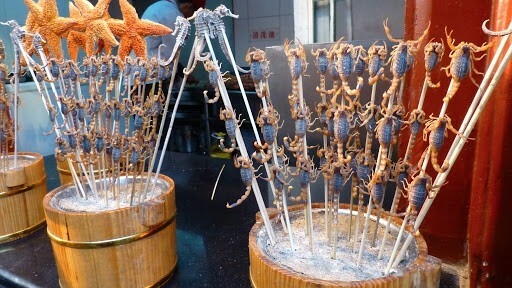 Yes, these are scorpions and they were alive! 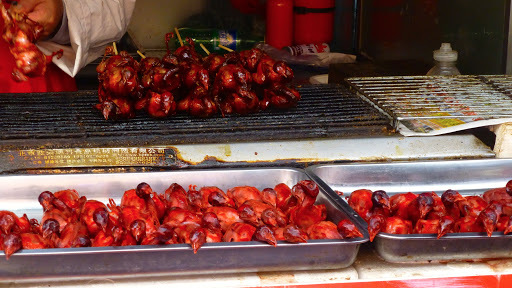 And yes, there were plenty of people eating them. Dave! Stop right there. Those writhing little critters are not for you. 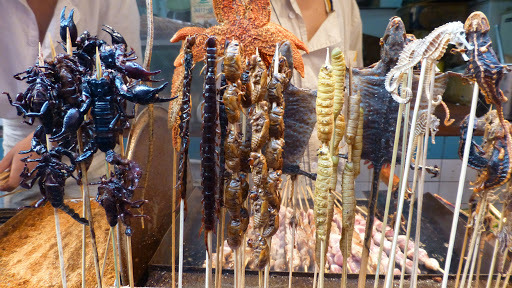 Who would’ve thought people would eat sea horses? Have to admit, we weren’t tempted to take a seat at any of these cafes. 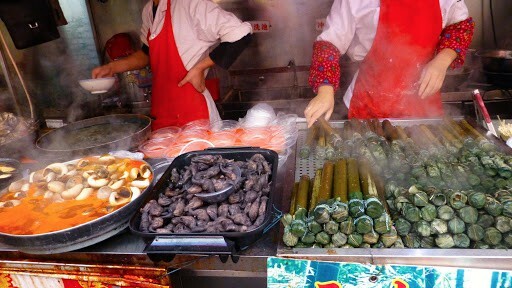 Beijing offered us everything we expected and so much more. Every box is being ticked here. We’re about to head to Tiananmen Square and the Forbidden City, and we’re all looking forward to that experience.